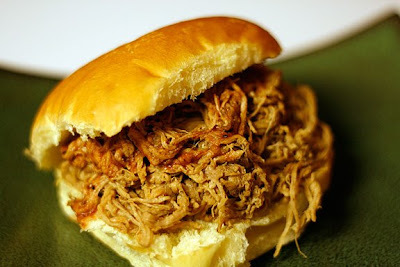 It's not real barbeque -- real barbeque is cooked slowly over hickory and is one of my favorite meals. 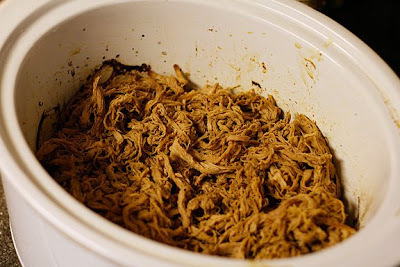 Faux-b-que is cooked in a crockpot. It's not the real thing, but it's a pretty nice replacement that can cook while you're at work. 1. 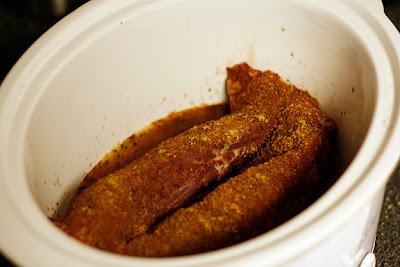 Apply dry rub to loin. 3. Mix together vinegar, hot sauce and liquid smoke. Pour over loin. 4. Cook on Low for about 8 hours. 5. Take two forks and rip the pork to shreds. 6. Apply the BBQ sauce of your choice. Being from South Carolina, I should naturally like mustard sauce. I'm actually partial to the Western North Carolina style sauces. These are similar to the vinegar/hot sauce concotions of Eastern North Carolina, except a bit of sugar and tomato paste is added back in help balance the vinegar and provide a bit more body. 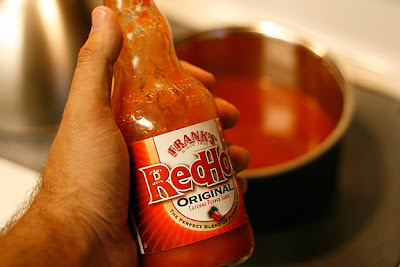 I like to add a portion of the sauce to the meat, and hold the rest back so that people can use as much as they'd like. Serve on a hamburger bun with some coleslaw either on top or to the side.